Rent boxes, tenant teleporter, HUD for stats, arrears, overprim reports, & more! Rent boxes with one script: LOW MEMORY, LOW LAG! Sign/teleporter: gives notecards, lists tenants, TPs visitors to rentals. Managers' HUD: report states, arrears, overprim, & access box menus remotely! Automated overprim warnings, rent reminders, optional end-of-lease autoeviction. ...AND MUCH MUCH MORE - SEE FULL DESCRIPTION! * Only ONE script in each rent box: LOW MEMORY, LOW LAG! * Welcome kits: gives new tenants gifts: landmarks, tees, even furniture! The Bright Rental System can be set up in minutes, making it *easy* to rent out space. Then, put the "Information & Teleport" box where you expect potential tenants to see it. As soon as it's rezzed, it will talk to the rent boxes in the region, noting locations, existing tenants' names, and vacancies. When a visitor clicks, it will display this list, complete with buttons offering teleports to vacant rentals (or, if the clicker is an existing tenant, to their own home). They will land under the rent box. On clicking it, they will be offered a notecard, and can begin renting just by paying. The money is instantly transferred to you, and their lease begins. They can click the box any time to count the number of prims they are using, check the length of their remaining lease, or pay to extend it. They will receive warning IM's before it expires, and if they go into arrears or over their prim limit. To manage your rentals, click the teleporter yourself, or wear the HUD and click that, or appoint managers and give *them* HUDs too!) It will display a menu of all the boxes in your region, with tenants' name, vacancies, rent arrears and overprim symbols. Click the button corresponding to a rent box to access its control menu remotely, or teleport to it: or click "Report" to receive more detailed statistics showing both details for each rent box, and totals for the group. It's as simple as that. These three tools - rent box, information & teleport box, and rental HUD - make renting out space a snap: providing your residents with the help and service *they* need, and you with the information and control *you* need. 2. Right-click the box and click "Open". A "Contents" window will appear: click the "Copy To Inventory" button at the bottom. 3. This will create a folder in your inventory called "Bright Rental System boxed #999". Inside, you will find three objects - the rent box, the "tp" or teleport box, and the HUD - plus a copy of this note. 1. Drag the rent box ("Bright Rental System box #999") from your inventory onto the ground in the space you wish to rent out. 2. Right-click the box and click "Edit..." in the pop-up menu. Three arrows will appear - red, blue, and green. Drag these to move the rent box exactly where you want it. Bear in mind that when visitors use the "teleport box" to tp to the rental, they will land inside the box - so the best thing to do is lift it about 2m off the ground, so visitors will land safely underneath. 3. Click the box and hold down the mouse button until it spins to make it remember its position. 4. Right-click the box, click "Edit..." again to open its object window. 5. Change the "Name:" of the rental box to something suitable: like "Room 11" or "Skybox 04". Keep names short and readable: at most 15 characters will appear on your teleport menu and in your reports. If you have more than nine rentals, remember that "Room 1" comes *after* "Room 10" in alphabetical order, so call it "Room 01" to ensure your lists are properly sorted. 7. The box will restart. Close the notecard window, and the edit window, by clicking the "X" in their top right hand corners. Repeat these steps for each space you wish to rent out. Note that if you have a lot of rent boxes to set up the same way, you can copy the first settings notecard into your inventory, and then drop it into all the other boxes to configure them instantly. 1. Drag the "Bright Rental System tp #999" to the ground. It can give out notecards, teleport prospective residents to vacant rent boxes, and teleport existing residents to their own rentals: generally you will wish to put it in a central, public space. But if you don't want people to see it, just make it small and place it somewhere hidden: but note IT NEEDS TO BE REZZED IN ORDER FOR THE RENT BOXES TO WORK. 2. Right-click it and select "Edit...". In the edit window which appears, click the "Content" tab. 4. If the land is group owned, "deed" this box to the group. If you don't, it will be unable to count prims on the land, and everyone will seem have to zero. Right-click, click the "General" tab, and click "Set..." to set the box to the right group. Then tick the "Share with group" box, and click "Deed...". The rent boxes must then be "Set..." to the same group: but need not (and indeed cannot) be deeded. 5. The box will spend a little time collecting information from your rent boxes: "floating text" above it will describe progress. When the text clears, click the box, and you will be shown a control menu for your rent boxes, described below. The HUD is optional. If you wear it, you can click it to access the same menu that you see when you click the "Information & Teleport" box (see above). It is handy if you'd like access to this menu wherever you are in the same region. It is transferable, so you can also give it to your managers to use similarly: though it will only work for them if they appear in the "*managers" setting of the teleport notecard (see above: note also, if one of your managers clicks the HUD and *holds down* the mouse button, they will be told their avatar's UUID, to use in the "*managers" setting). 1. Right-click the object "Bright Rental System hud #999" in your inventory and click "Wear". It will appear in the bottom-right of your screen. If you already have a HUD there and wish to put it somewhere else, choose "Attach To HUD" instead of "Wear", and then choose the location you want from the menu. 2. Right-click the HUD and select "Edit...". In the edit window which appears, click the "Content" tab. 4. Close the notecard and the edit windows by clicking the "X" in their top right hand corners. The HUD will restart, and collect information from all the rental boxes. 5. Right-click the HUD and click "Detach". Then, find it in your inventory and "Wear" it again. This forces Second Life to save the changes you have made to the notecard. Click a rent box to see its menu. "Reset" restarts the rent box: but without losing the resident's name or lease information. "Open/Close" lets you "close" the rent box against payments - any payments made will be returned immediately. This prevents new residents starting a lease, or can be used to allow a resident to see out their lease, while preventing them from renewing. If the box is vacant, the "rent me" textures is replaced by one with the word "RESERVED" pasted diagonally across it. (See the settings "*rent-texture" and "*closed-texture" above). "Teleport/IM" puts a special web-like "link" into chat, a little like this: "Click to go:.../Click to IM Shan Bright:..." Click on these links to teleport to the rent box, or to display the profiles of the tenants. "Rent IM" and "Prim IM" both send instant messages to the resident, the first reminding them when their rent is due, the second warning them that they are over their prim limit (if they aren't, it will not be sent). "Evict" will immediately remove the residents name from the box and return it to a "vacant" state, while sending an instant message to the tenant to tell them their rental has been ended. "Clear" does the same as "Evict", but without sending an eviction notice - thereby simply clearing the residents details from the rent box. "Resident 2" will only appear if you have specified "*sharing yes" in your settings notecard. It will produce a message like "Click 'Clear 2' and remove any existing 2nd resident, and ask your new one to say '/657393 hello'." Once the 2nd resident has repeated the message (including the PIN number) within hearing of the rent box, they will have their prims counted towards the rental's prim allowance, and receive rent and overprim messages. Their prims will no longer show as "OTHERS" on the rental report (see above). "Clear 2" will only appear if you have specified "*sharing yes" in your settings notecard. It removes the 2nd resident from the box. "Notecard" gives you a copy of your own rental information notecard. "Adjust" will only appear if the rental is occupied, and will allow you to change the terms of the current tenancy. Clicking it will display a submenu, with "Adjust lease", "Adjust rent" and "Adjust prims" buttons. Click these to add or remove time to the lease, Lindens to the rent, or prims to the allowance. Please bear in mind that these changes will only apply to the current tenant: when they leave, the rent and prim allowance will be reset to those specified in the settings notecard. To permanently change the rent or prim allowances, therefore, change them in the notecard. "Welcome kit" will appear if you have specified "*give yes" in your settings notecard. They can click this button to have their welcome kit redelivered. "Leave" will end the residents lease. "Refresh", "Resident 2", "Clear 2", and "Notecard", as above. Other people clicking the rent box will simply see a "Notecard" button, which will provide information about the rental. When clicked, the teleport box displays the number of vacancies, a list of your rentals in the region, and the names of residents against those which are occupied. Residents can click "Notecard" for your rentals information notecard, "" to page through the list of rentals, or a numbered button to teleport to a particular rent box. Anyone can teleport to a vacant rental: but to protect their privacy, only residents can teleport to the boxes they occupy. As the owner of the system, if you click the box, you will see additional symbols against each name: "@" if the resident is in arrears, "!" if they are overprim, and "#" if the rent box has been closed. These details are not shown to other users. If you click a numbered button, you will see the same menu you would see if you clicked the corresponding rent box, allowing you to control them remotely. If you wish to travel to them, click "Teleport". (If you have rent boxes on multiple parcels in a region, please note that the "residents" prims are counted on the parcels housing their rent boxes, whereas the "other" prims are those belonging to non-residents on the parcel housing the teleporter itself). Clicking the HUD displays exactly the same menu as clicking the "information & teleport" box described above: so wearing the HUD gives you access to this, and all therefore to all the rent boxes, wherever you are in the region. It is transferable, so you can also give copies of this HUD to your managers: though it will only work for them if their UUID is included after the "*managers" in the teleporter settings notecard. They can learn their UUID by clicking their HUD and holding down the mouse button until they hear it in chat. If you are updating an older version of the Bright Rental System, you may find it easier to replace the scripts in your existing rent boxes and teleporter than to replace them. 1. Rez your new "Bright Rental System box #127". 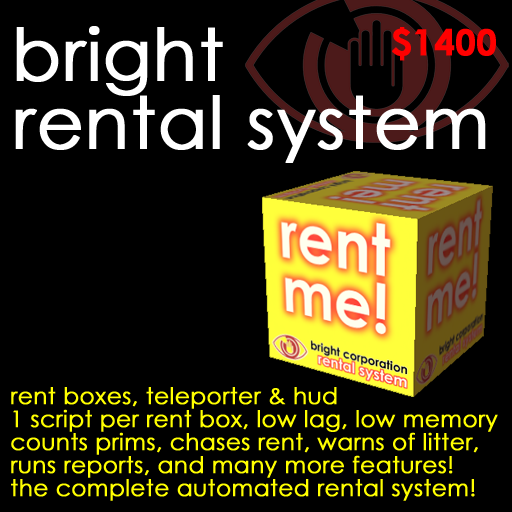 Right-click it, click "Open", and drag the script "Rental box #117" from the "OBJECT CONTENTS" window to your "Bright Rental System boxed #011" folder. 2. Rez your new "Bright Rental System teleporter #130". Right-click it, click "Open", and drag the scripts "Rental litter warner #005" and "Rental teleporter #146" to your "Bright Rental System boxed #011" folder. 3. Visit your first rental, drag the script "Update old rent boxes #001" from your "Bright Rental System boxed #011" folder, and drop it over the rent box. It will remove the old rent box script, and convert any saved tenancy information. 4. Drag the script "Bright Rental System box #127" from your "Bright Rental System boxed #011" and drop it over the box. Repeat steps 3 and 4 for all your existing rent boxes. 5. Right-click your teleporter, click "Open", and delete the scripts inside. Then drag the scripts "Rental litter warner #005" and "Rental teleporter #146" to your "Bright Rental System boxed #011" folder and drop them over your teleporter. * Choose short, meaningful names for your rental boxes. These names will appear in the list shown to potential residents, in your HUD's listing, and in IM's sent to your residents. If you have more than nine, use numbers like "01, 02... 10", so that they sort properly: remember that "Room 1" sorts alpabetically *after* "Room 10". * Set up a residents' group, and restrict object rezzing rights on the parcel to that group: this prevents others soaking up your residents prim allowance. * While many landlords manually add new residents, consider making the group open. Few bother to join a group simply to let them leave litter, especially if you charge a fee for joining, which you can then refund to legitimate residents, or treat as a deposit. An open group gets rid of that period which all residents hate between paying rent and actually being able to move in. * Write your own information notecards for the rent boxes and teleport boxes: tell them why your rentals are unique, and make them feel welcome: set "*give" to yes, and put a few welcoming gifts in your rent boxes. The better residents feel about moving in, the longer they'll stay!